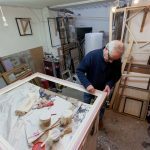 Primrose Hill Framing Company after 12 years in the framing business this family business has gone from strength to strength, framing anything from photography and fine art to a Tibetan coat and stone age tools. From museum glass finish to bespoke hand crafted frames, all your framing needs are covered here. So pop in for a quote with your weird and wonderful items you want displayed beautifully on your walls, they’ll be only too happy to help.